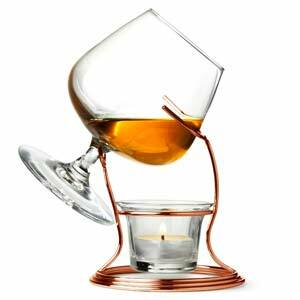 Brandy and cognac are sophisticated drinks, and are best enjoyed warmed so serve up the best drinks with this Copper Cognac & Brandy Warmer With Glass. Originally brandy was warmed using the warmth of your hand but that could mean waiting a long time to enjoy your favourite drink, so the brandy warmer was designed to warm brandy releasing it’s fumes and hidden potential quicker than ever. This gift boxed set comes complete with a copper plated frame that is sure to impress friends and family and is the perfect finishing touch to anyone’s fabulous library, country manor, Irish Castle or, you know, your living room. As well as a show stopping copper frame this set comes complete with a high quality, classically shaped brandy glass, tea light holder and tea light, all you need to get started is your favourite bottle of brandy or cognac.